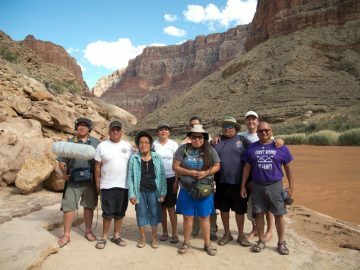 The talking head interview that appears in the short film, Martin’s Boat, was the very first one in a collaboration that later became known as “The River Runners Oral History Project,” conducted by Grand Canyon River Guides and housed at Northern Arizona University’s Cline Library. I recorded Martin’s interview at the OARS boat house in Flagstaff on the evening of October 10, 1992. 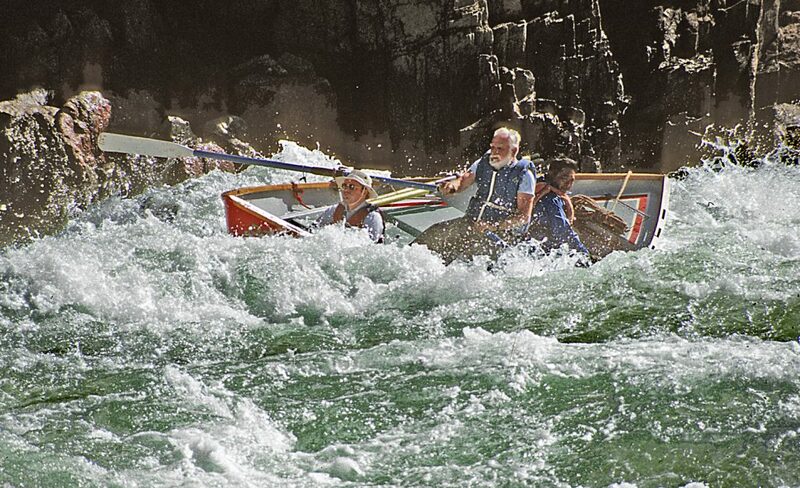 Also present were OARS/Grand Canyon Dories boatmen Kenton Grua, Denice Napolitano, and Bronco (Bill Bruchak). Martin was 75. 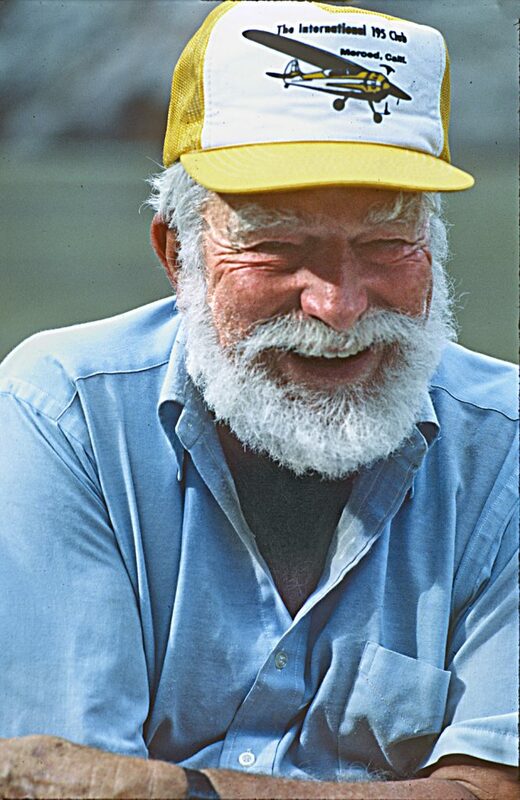 He had just gotten off an OARS/Dories trip with Bronco and was now looking forward to getting a hip and knee replacement. He would continue to run the river for another 15 years. 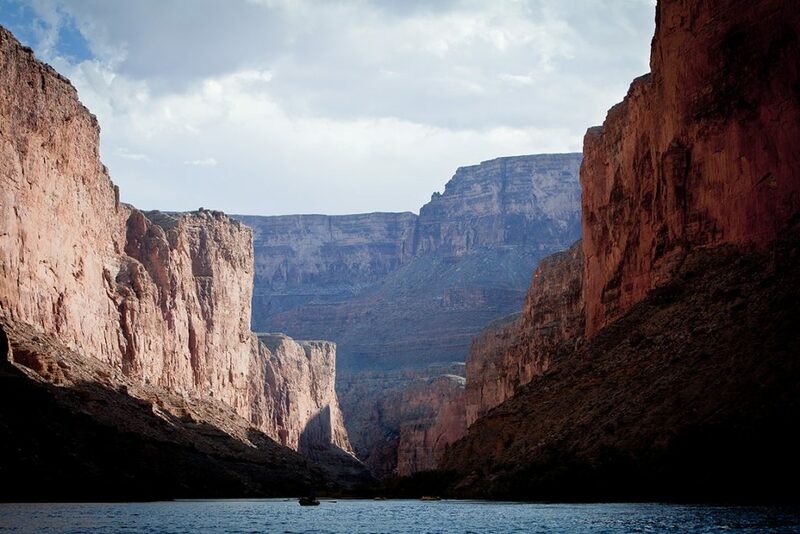 Kenton Grua, following in Martin’s footsteps, started Grand Canyon River Guides (GCRG) in 1988 to give working boatmen a voice in the management of Glen Canyon Dam. GCRG helped get the Grand Canyon Protection Act, which mandates concern at the dam for the downstream resources, passed by Congress. My friends at GCRG, including Kenton, assigned me the task of recording oral histories because I had recently become a sound recordist and had just finished work on my first couple of movies. I rented a fancy camera for the interview with Martin and ran it myself and was mortified at the quality of the video when I got it home and saw it on a color monitor. Now that Martin is gone, the picture quality doesn’t seem so bad. The River Runners Oral History Project today includes more than 120 interviews. 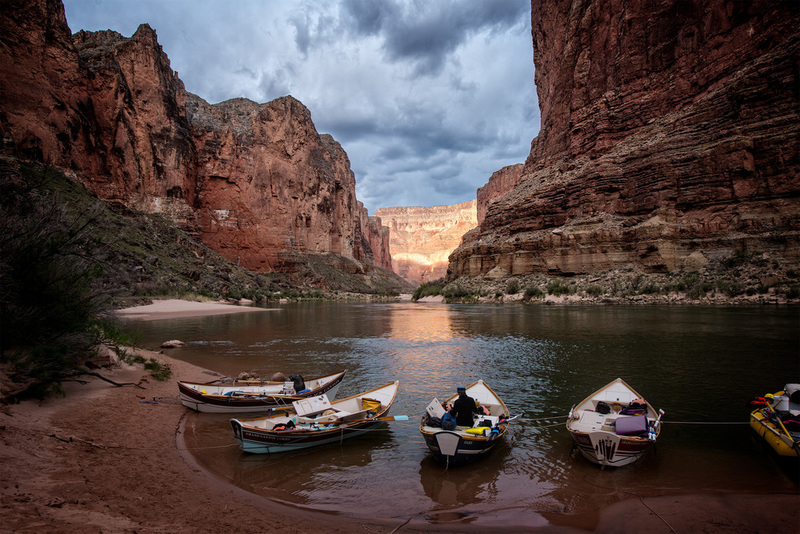 Grand Canyon River Guides—steadfastly supported by OARS and other Grand Canyon river companies for almost 30 years—is still going strong. 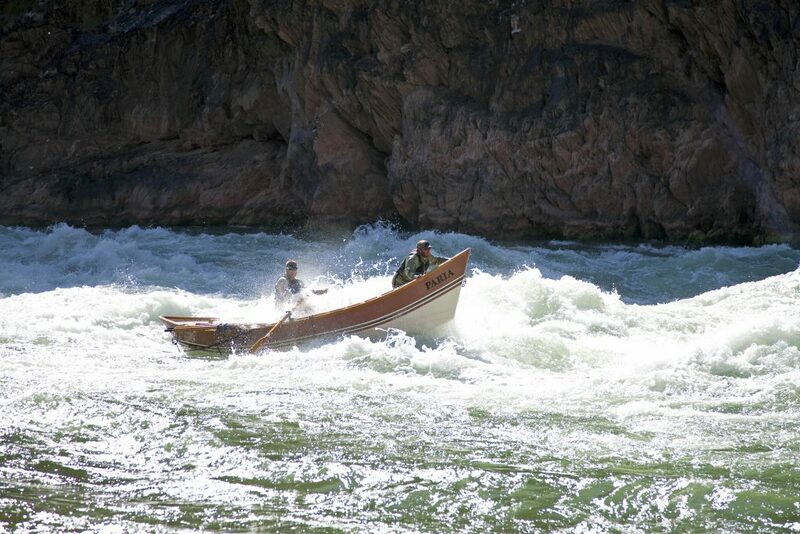 I’m really proud of OARS for building the Marble Canyon and making Martin’s Boat to help carry on the story of what Martin did at a key time in history and what the dories really mean to everyone who runs the river in Grand Canyon today, regardless of what kind of boat they’re in. An except of Steiger’s conversation with Martin Litton follows. The interview was originally published in The News—now known as the Boatman’s Quarterly Review—Volume 6 Number 1, winter 1992-1993. We caught him red-handed at the dory warehouse in Flagstaff, in the fall. He was sitting in the Ootsa Lake sponging his hatches out, just off a Grand Canyon trip. 75 and still doing it. His third trip in two years. “Golden trip,” he said, and Bronco laughed. Martin Litton grunted. Scowled at Bronco for passing secrets. Georgie Clark did it until she was 82, but she didn’t have to jump off and tie her boat up either. She didn’t have knee surgery pending and her boat was a little more stable, too. Last year Martin got sucked left at Bedrock. He flipped after he got over there and it wasn’t pretty when he came out the other side. Took a lot of C-clamps and duct tape to fix that one. But here he comes again, back for more. Indefatigable. Don’t think he doesn’t know what a golden trip is, though, or that it doesn’t mean something to get through clean, no matter how many times you’ve pulled it off. They’re tippy little boats and they make a bad sound when you hit a rock. Only a certain kind of person…touched, would think of starting a company that ran a fleet of them. Wooden dories named after lost places. Who but a crazy man would dream up such a thing? We sat Martin down and cranked up the old tape recorder for about two hours, trying to find out. It wasn’t enough. Nowhere near enough time to do more than grab a faint sketch of one man’s part in a very big story. He grew up in the Depression. 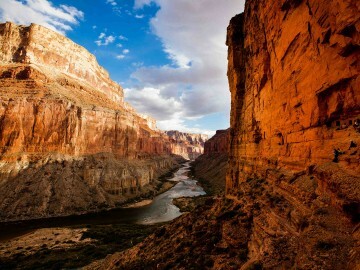 First saw the Grand Canyon in 1939, when he was 22-years-old. 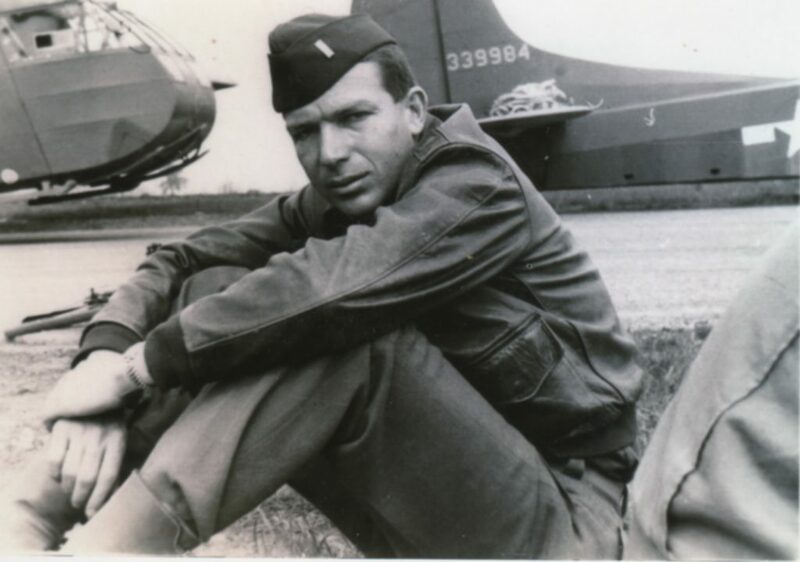 Became a glider pilot in WWII, landing troops behind enemy lines in the thick of the European invasions. Hiked in at Toroweap in ’51 and took photos of the Rigg brothers lining Lava Falls on a Mexican Hat trip. Met the Hatch boys up in Utah around ’52, when they were teenagers learning to be guides. Wrote articles on Dinosaur for the LA Times and got enlisted by the Sierra Club because of what he said, the photos he’d taken. 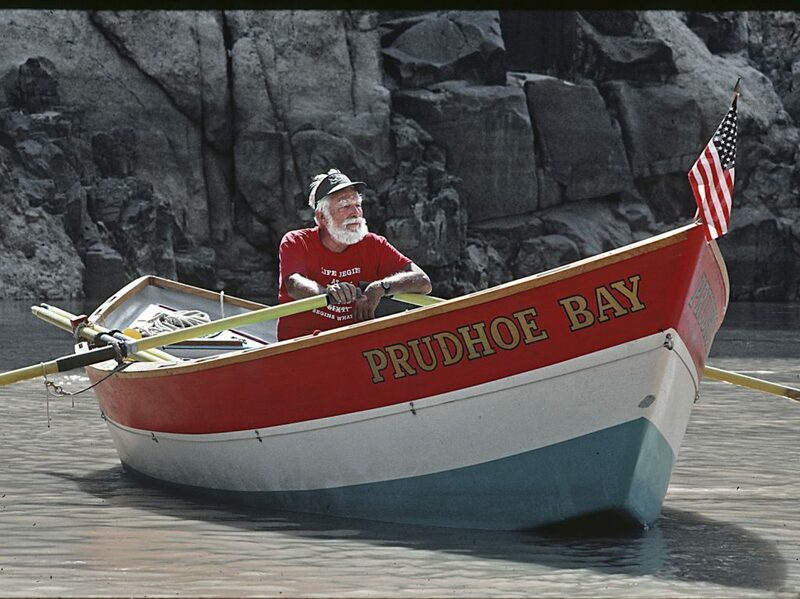 He ran the Grand in wooden boats with Pat Reilly in ’55. 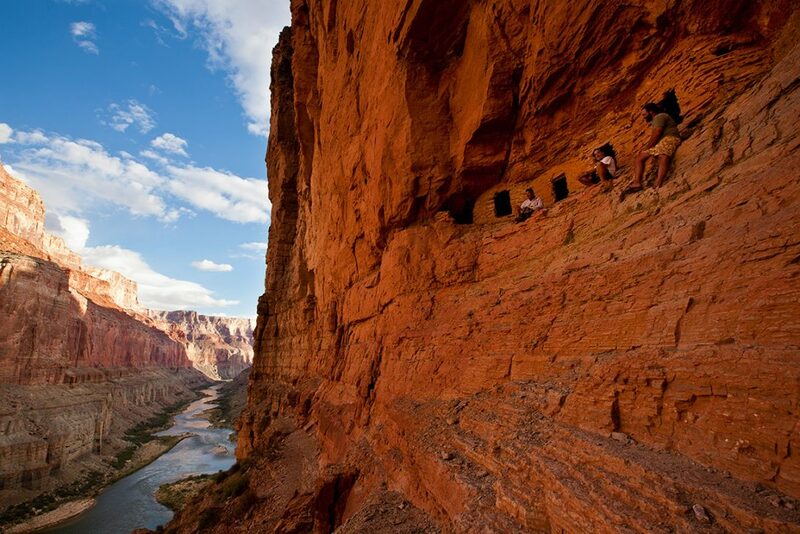 According to David Brower, Martin Litton saved the Grand Canyon. Turned the Sierra Club board of directors around at a critical moment in the Marble Canyon Dam fight. 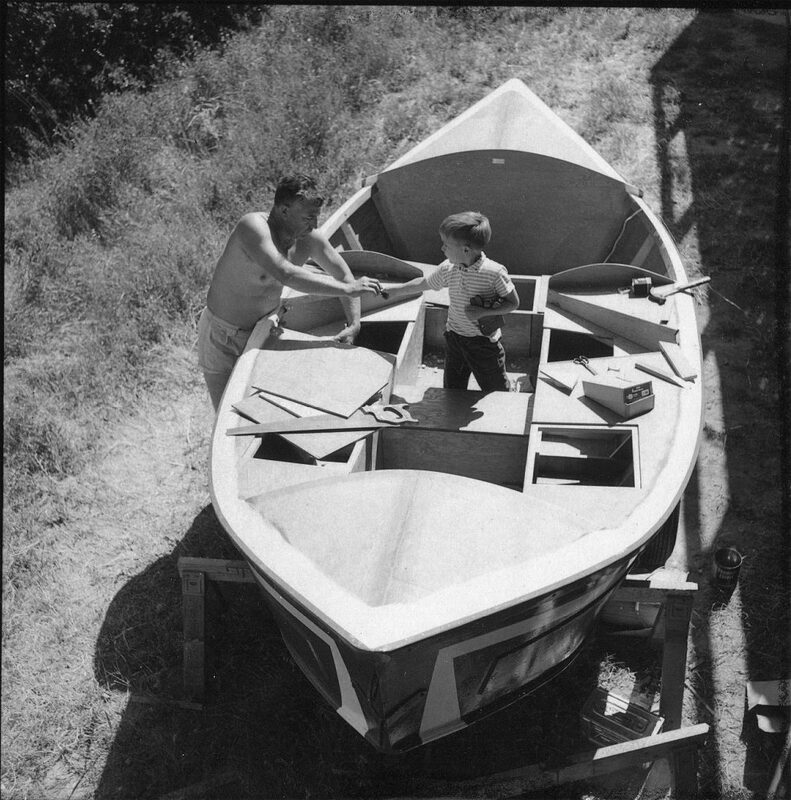 Asked “Why use dories?” He says, “Anyone who looks at a dory and has to ask why…will never understand.” Then he rambles for twenty minutes non-stop about their virtues, never once touching on their unique disadvantage (which comes to mind every time you hit a rock in one). 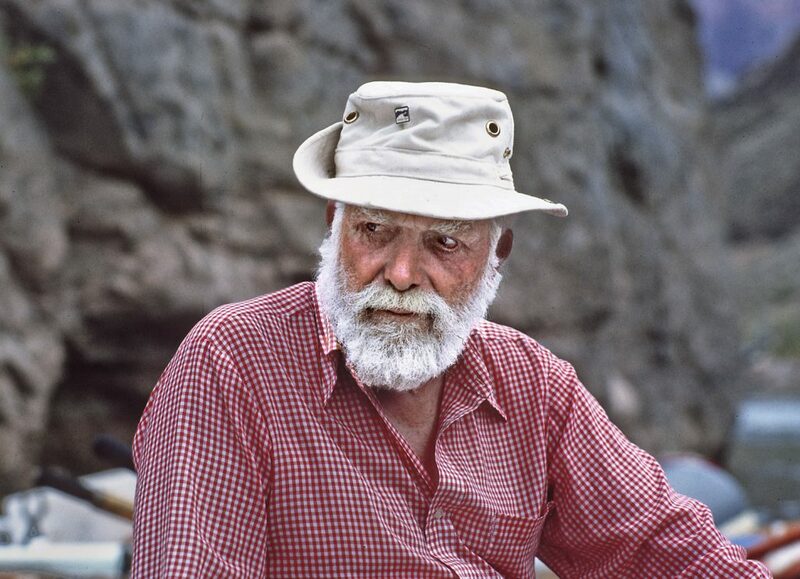 He was against motors in the ’70s and according to one of his original boatmen, no one on a dory trip was allowed to bail in sight of a motor trip. Everybody had to sit still and smile till the motors went by, even if they sat in water up to their belly buttons. He is not a saint. Rumor has it he’s been known to take a drink every now and then; known to scare people half to death barnstorming around in his airplane; known to admire a beautiful woman or two. Rumor has it that he was not the greatest small businessman who ever lived, or the most organized. But something about him is special, almost larger than life. And sitting in a room with him, asking him to relive the old battles, you can feel that. He’s right about the dories of course. Most boatmen who see them don’t have to ask why. “Oh yes we do,” Martin said, and they ordered hulls from Oregon. 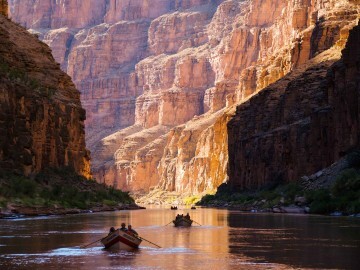 Which, once they got them decked over, became the first dories to run the Grand Canyon. One of them (Reilly’s) resides at the South Rim today. Slowly the boats evolved. Reilly packed it in eventually but Litton kept going. His fleet matured and grew, and finally each boat began to take on her own special identity. You have to hear Litton talk to really appreciate him. His voice is warm and gravelly, mellifluous. He is a world-class charmer and in light of all he’s seen and been and done, it’s nice to realize he’s mortal too. It wasn’t a grandly inspired plan or a vision from God he’s been operating under. He just got sucked into this thing like the rest of us. Couldn’t say no. And the finer moments? For him too, they just…happened along the way. The tape rolled on. There came a point in time where the interviewer began to panic. Litton—warts and all—was something all right, and the history of the dories was too, but we were just blasting by the bulk of it at warp speed. “Hit the high spots,” Karen Underhill (the NAU archivist) had said. “Go for the most important things. Don’t assume you’ll get another chance.” But what were those? Words of wisdom? Pointers on how to deal with boating in the ’90s? He has changed his mind about motors. Worked against them for many years but now realizes if you’re going to see the numbers the Park wants down there, you have to have them. One hears this comment and has to wonder how much Martin really knows about normal routines, or the good it might do to get away from them. 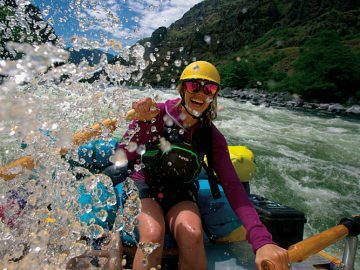 The early days on the river were anything BUT routine. They never ran Lava Falls at first—didn’t dream of it. One party (not a trip Martin was on) gave up trying to line it at a particularly bad stage and just let their boats go. Hiked out and hitched a ride around to the lake to pick them up. They found one boat still floating and Georgie towed another one out upside down. All the hatches had blown off it and the cameras were gone and people on the trip thought Georgie had stolen them. “Ridiculous,” Martin said. He’d flown them around looking for the one Georgie didn’t tow, anyway. One particularly bad day dawned at Crystal shortly after it was formed in ’66. “Well…where does the Grand Canyon fit now, then? In the ’90s? There was a way that Martin said the last part. You knew he wasn’t talking about just the river. It got to us, and the silence stretched out for quite awhile. A handful of us gave him a lift to his plane the next morning because Coby Jordan had cautioned us not to miss the experience. We got to the airport and sure enough, she was a beauty. A 1949 Cessna 195 tail-dragger. Pure Humphrey Bogart. Enormous radial engine, little bitty windshield, clean glorious all-American lines, just like the old cars from that time too. Classic. The country’s finest haul: Martin fired her up and blue smoke belched and billowed out of the engine. A lot of smoke. It streamed past the fuselage and out across the airfield while the engine caught and spluttered and finally gathered itself into a roar. (Martin had warned us about this in advance. Something to do with oil dripping whenever she sat idle.) We stood off to the side and watched the old girl warm up and settle down, all choked up over something we couldn’t really describe. Finally the smoke thinned a bit and Martin throttled back long enough to toss a comic aside out the window at us. He squinted at the horizon, then turned back toward us. Vroooooom. He was back on the throttle and moving once again, off down the runway. 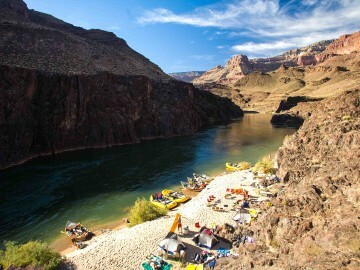 Lew Steiger has been working in the Grand Canyon since 1972 and rowing dories commercially since 1987. 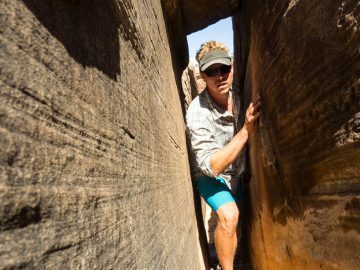 He’s also an editor for Grand Canyon River Guides’ expansive Colorado River Runners Oral History Project.